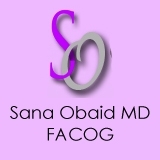 Dr. Sana Obaid MD, FACOG Obstetrics & Gynecology (Woodland Park) - Book Appointment Online! Dr. Sana Obaid provides comprehensive gynecologic care from adolescence through menopause. It is important to partner with a sensitive and skilled gynecologist throughout stage of life.